Without a scale reference it's hard to tell that Flybon and Mantisoid are each over 40 stories tall. The epic battle lasted six hours and leveled half of Tokyo. My second favourites (spiders are first), they are gorgeous! 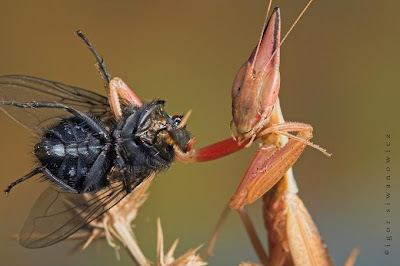 I watched a huge tyke eat a spider like that once, it was sad for the spider but awesome to watch a mantis in action. Why why why did I come to this site after dinner?!?! Anything that takes down the fly population is OK in my book! Go get im! You've got to wonder how having that cone disguises it to the fly. 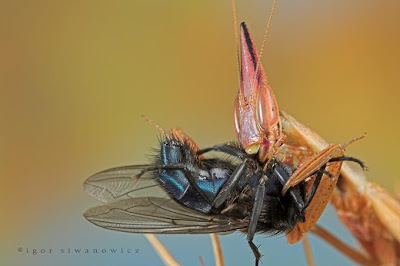 I mean, I guess it probably looks like some local flower, but now I just think about a fly looking at two identical mantids, one with cone, one without. "Safe. Not safe." Or maybe the mantis is heading out to work, and its spouse says, "Oh honey! Don't forget your cone!" "Oh, that was a close one, hun'!" I love evolution. Aside from the fact that Mantis kung-fu is greater than my own... they are super polite bugs. They always clean themselves with their legs, and their little heads are so cute when the size you up for a showdown.